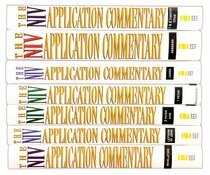 Now complete, the NIV Application Commentary New Testament Set shows readers how to bring an ancient message into a modern context. It explains not only what the Bible means but also how it can speak powerfully today. From Zondervan. Most Bible commentaries take us on a one-way trip from the twentieth century to the first century, and along the way involve us in any number of valuable discussions. But sometimes, we feel like something has been left out. While we want to know the background of the biblical text, we also want help determining what it means for today. The creators of the NIV Application Commentary series believe that if we remain in the ancient world and don't translate the Bible into our world, the task of biblical interpretation remains incomplete. Thus the NIVAC series provides both the historical-exegetical meaning of the text, while also providing a bridge from the ancient world to the Bible's relevance today. Furthermore, the format of the NIVAC reflects its content by clearly denoting when it is discussing ancient context, the interpretive process that allows us to understand the text in our own setting, and when it is applying interpretations of the text to our daily life. This obvious nature of the format makes it exceptionally easy for the reader to know exactly where they are in the commentary itself, the interpretive process, as well as in the biblical book. In addition to its unique reader friendly format, the NIVAC is directly pinned to the NIV translation of the Bible making it, once again, exceptionally easy for non-specialist readers to follow the thoughts and direction of the commentator. While authors will, at times, work with the original languages full descriptions about any such terminology are given in non-technical language. Moreover, each author fluidly translates complex elements and interpretive matters into language the average lay person can fully understand and easily apply. About "New Testament Set Complete (20 Volumes) (Niv Application Commentary Series)"
Discover how the message of Acts can have the same powerful impact today that it did when Luke first wrote it. Acts tells the story of early church leaders actually doing the work of outreach and ministry. It reminds us that being a Christian is not an armchair activity. This practical, insightful commentary will challenge you to let your actions be part of the long history of the acts of the Christian church. 656 pages, from Zondervan.